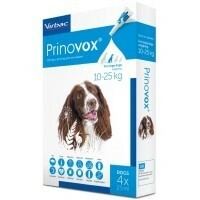 Prinovox Spot-On Solution for Large Dogs is for use in larger breed dogs weighing up to 10-25kg. It is a broad spectrum parasiticide for the treatment and prevention of lungworm; for the treatment and prevention of fleas and also for lice, mites, heartworm and roundworms. Each 2.5ml pipette contains as active ingredients: Imidacloprid (250mg) and Moxidectin (62.5mg).